Challenge PokerSnowie is a training feature which lets you play directly against the Artificial Intelligence engine. 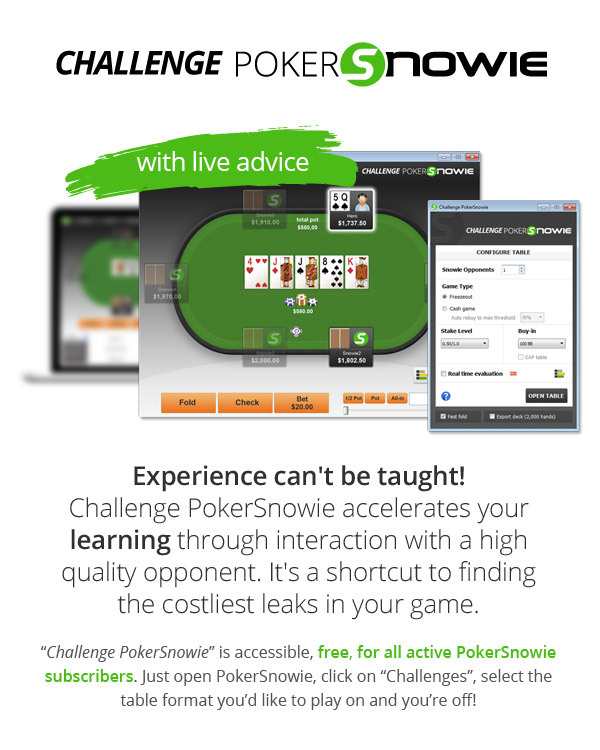 Challenge PokerSnowie accelerates your learning through interaction with a high quality opponent. It’s a shortcut to finding the costliest leaks in your game. PokerSnowie is powerful neural network training software which will improve your No Limit Texas Hold’em. Based on artificial intelligence and developed for all ability levels, PokerSnowie is the perfect partner to help you become a stronger player. PokerSnowie powers a range of poker training and coaching tools which will rapidly increase your experience level and avoid the pitfalls of trial and error. The Snowie philosophy is that hard work doesn’t have to be a grind. PokerSnowie continues to evolve leading-edge products which allow you to learn, train and challenge in the most interactive way.